Here’s a blog post that I recently wrote for the MySMPS.org Web site. One of the necessary attributes for marketers of professional services is a certain level of creativity. We’re typically not the “out there” creatives like true design architects, but are more creative than “back-of-house” engineers who happily draw boxes forty hours a week (I can say that: my father and brother-in-law are engineers!). Personally, I try to exercise the right side of my brain through my hobby: writing and photographing local interest books. Of course, the hobby comes in handy for my day job, too – how many of us take project photos (particularly in this time of shrinking marketing budgets which can no longer afford architectural photographers!)? So, here are a few tips to help your project – or vacation – photography. On my last night in Boston, after the Build Business 2010 conference had wrapped up, I decided to go exploring with my camera in hand. 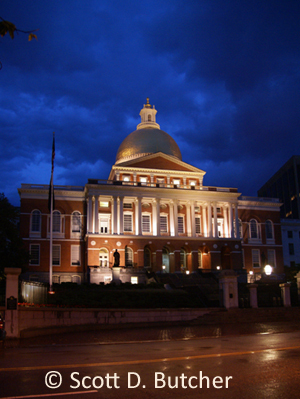 I’ve had the pleasure of visiting Boston several times over the years, but never with my trusty DSLR. I set out from the hotel on foot, late in the afternoon, with visions of social media marketing still spinning in my head. 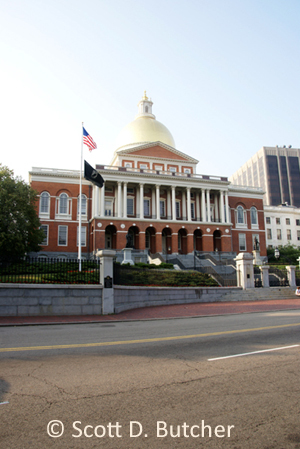 My goal: photograph some of the historic buildings along the Freedom Trail, beginning with the Massachusetts State House that watches over Boston Common. This is the type of photo that you might have taken, and certainly the type of photo that your technical staff provides you with when you ask them to take some photos for marketing on their next site visit. The sun was in the wrong place. Had I been there earlier in the day, the front of the building would have been bathed in sunlight. Alas, I was left with this rather boring image of a building in shadow, overexposed dome fading into the washed-out sky because I was shooting toward the sun. I continued onward, and took some nice shots of other buildings along the way. Many blocks later, tired, sweaty, hungry, and thirsting for a date with Boston’s own Sam Adams – on tap, of course – I decided to break for dinner. Soon it was pushing 7 p.m. and Club SMPS was getting underway over a mile away. The sun dropped behind the skyscrapers and the sky began to darken. Perfect, I thought: I can get some “night” photography. I began retracing my steps. Within minutes, tiny droplets of precipitation began to fall from above. You’ve got to be kidding me, I thought. Alas, Mother Nature was not kidding, and I soon found myself sprinting for the nearest canopy. When I was safely out of the rain, I wiped down my camera and returned it to the camera bag, which I had fortunately brought with me. Of course, I still really wanted to get a few images, particularly of the domes and steeples that are beautifully illuminated at night. So I began my pattern of duck, run, cover and shoot, block-by-block. This entailed ducking my head as I sprinted to the next area of cover (awning, canopy, marquee, tree), then unpacking my camera and taking a few photographs before returning the camera to the bag and repeating. 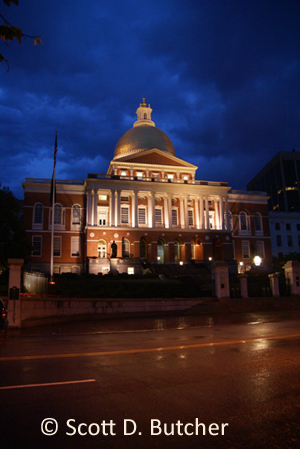 This is the image I took of the Massachusetts State House. The image above is exactly as I took it. The only thing I did in Photoshop was (1) rotate it, and (2) downsample and reduce the image size to post online. So here’s a few tips about how this photo was taken – maybe they can help you on your next photo expedition. First, look at the sky in the photograph. There is still color in it. “Night” shots are actually best taken at twilight, because there is still some light in the sky and texture on buildings. Second, while clear, deep blue skies can often enhance the drama of a daylight image, cloudy skies can often elevate the appearance of night photographs, providing detail and texture around your subject. Third, rain can further enhance a photo at night. Streets and parking lots often distract from a building photo, but the wetness creates reflectivity and adds visual interest. Plus, light rain is often not visible in an image, particularly if you are using a slower shutter speed. Fourth, take a tripod. I broke this rule, but it is an extremely important one. As it gets darker you will need longer and longer exposures to record detail. If you don’t have a tripod, however, all is not lost. I’ve used parking meters, benches, walls, car roofs, other people’s heads and shoulders, etc. to help steady my camera. In this case I was hiding under a large tree, which was shielding me – and my camera – from the light rain that was falling. I was “forced” into this viewpoint to keep the camera dry, but able to lean up against the tree trunk to help steady myself. Here are a few other steps I took to attempt to counteract the longer exposure time that was necessary: I took multiple photos. I had (rightly) assumed that some of them would be blurry because I was hand-holding the camera. But some like the one above were also sharp, not suffering from blur. I also changed the ISO setting on the camera. Remember the days of film? ISO speeds of 64 or 100 gave us very sharp, grain-less photos, but required longer exposure times. Higher speed films with ISO ratings of 800 or 1000 allowed us to shoot in very low light, but added grain to the images. The same concept applies with digital photography. Your camera (even if it is a point-and-shoot) is probably currently set for “automatic” ISO. I changed mine to 400 to balance my need for sharp images with the low-light conditions in which I was shooting. I love my DSLR camera, but it is on the lower end of the scale when it comes to bells and whistles. Most $200 point-and-shoot cameras today are more feature-rich than my DSLR. With these cameras you can set “night mode” for longer exposure time, adjust the ISO settings, select both the shutter speed and aperture settings, and do much more. Most cameras (including mine) also have some sort of anti-shake technology to allow for hand-holding under low-light conditions. To be honest, I left the exposure settings up to the camera in this case, using its automatic settings. I also used auto-focus, which is sometimes challenging under darker conditions. To help my camera properly focus, I placed the brightest part of the building in the center of my camera’s viewfinder, partially depressed the shutter to “lock” the focus (and exposure settings), and then recomposed. Finally, be patient. Even though it was a rainy night in Boston, it was a Friday night. There were lots of people and lots of cars. I had to time my shots to avoid the people and cars. Had I brought a tripod with me, I could have used longer exposure times and included passing cars – the cars wouldn’t have shown in the photo, but steaks of white light from headlights and red light from taillights would have been visible, which would also have enhanced the photograph. Here’s the photo again, after a few very minor tweaks in Photoshop. My “labor-intensive” photo-editing took approximately one minute, and involved the following: (1) I used the Transform –> Perspective tool to correct the parallax, which is the “sloping wall” effect that it often present in architectural photographs. I was only worried about correcting the wall on the left side of the image because I had photographed the building from an angle, not straight on. (2) I adjusted the levels by using the Levels (duh!) tool and setting the black and white points only. And (3) I cropped the photo to reduce the amount of street visible. Does this make sense? Do you have any questions? Is there another photography-related topic you’d like me to blog about?